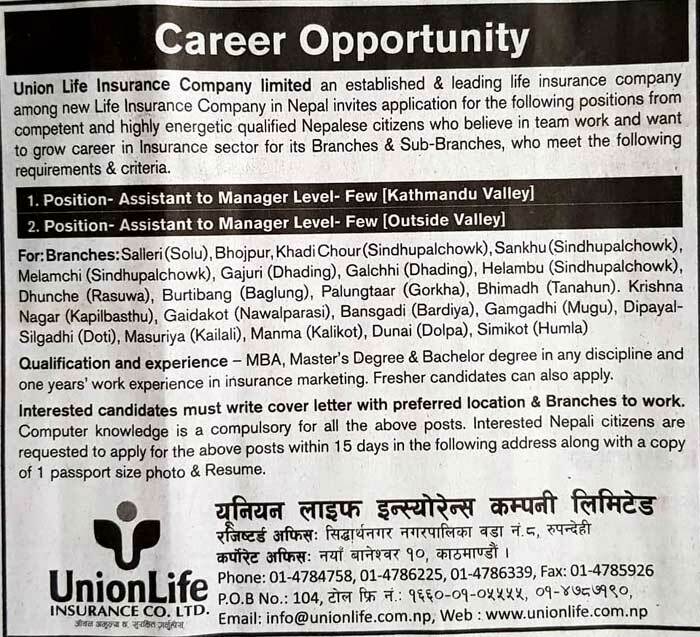 Union Life Insurance Company Limited an established & Leading life insurance company among new Life Insurance Company in Nepal invites application for the following pistons from competent and highly energetic qualified Nepalese citizens who believe in team work and want to grow career in Insurance sector for its Branches & Sub-Branches, who meet the following requirements & criteria. MBA, Master’s Degree & Bachelor degree in any discipline and one years’ work experience in insurance marketing. Fresher candidates can also apply. Interested candidates must write cover letter with preferred location & Branches to work. Computer knowledge is a compulsory for all the above posts. Interested Nepali citizen are requested to aply for the above posts within 15 days in the following address along with a copy of 1 passport size photo & Resume.